SCPA: The port handled 196,439 TEU in April. Moody's and Standard & Poor's have affirmed the port's financial position with positive ratings. SCPA plans to issue approximately $300 million in new revenue bonds to fund several major capital projects. The South Carolina Ports Authority announced the highest April container volumes in its history, with growth of four percent over the same month last year. SCPA handled 196,439 twenty-foot equivalent container units (TEU) in April. The port has moved 1.8 million TEUs across the docks of its Wando Welch and North Charleston container terminals since the fiscal year began in July, an increase of nearly two percent over the same period last year. Inland Port Greer handled 9,577 rail moves in April, pushing fiscal year-to-date volumes slightly ahead of last year with 96,937 rail moves since July. Fiscal year-to-date breakbulk volume in Charleston reached 608,829 tons in April, with 51,426 tons of non-containerized cargo moved last month. The port handled 17,646 finished vehicles in April. 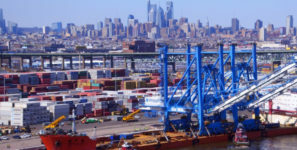 The port also announced that Moody’s Investors Service and Standard & Poor’s Ratings Services have affirmed the port’s financial position with positive ratings. The ratings come as SCPA plans to issue approximately $300 million in new revenue bonds to fund several major capital projects, including Wando Welch Terminal upgrades, Phase One of the Hugh K. Leatherman Terminal, SCPA’s new headquarters and other improvements to existing facilities. Moody’s issued an A1 rating with a stable outlook to the port’s upcoming Series 2018 bonds and Series 2015 bonds, citing SCPA’s cargo volume growth, competitive infrastructure and operating model, and strong historical financial metrics as drivers of the credit positive profile. The ratings include analysis of financial performance, volume growth, customer diversity, performance relative to competitors and future capital projects. The SCPA is solely responsible for the revenue bonds it issues, with no obligation of the state or taxpayers.